I was savoring salmon and salad at the table, looking over a wind-ruffled lake. The light was hinting at bronze and the air had the scent of fall on its tail. It was good to spend time with four family members. My oldest sister had just had a pacemaker successfully implanted and was smiling again. My brother-in-law had recovered from a debilitating illness he contracted when travelling in southwest Asia. My other sister and Marc, my spouse, and I had come to the Seattle area to visit for the week-end. It had been a satisfying day spent at a botanical garden and the Chihuly Garden and Glass exhibit. Winding down, we talked about a little of everything with a comforting rapport, despite our varying views. It struck me that I had had a lifetime or a few decades hanging out with my family, yet they are still enigmatic. We each carry our particular experience in complex ways that no one can entirely comprehend or embrace. Spoken or written language carries us closer to understanding and touch speaks intensely. But there are frequent occasions of partial understanding with fewer moments of thorough comprehension of who we truly are and what we mean to offer. R.’s voice was resonant with the vivid recollection, and his blue eyes sparked with the wonder of it. He leaned forward, elbows on the table. I studied him. R. is a strong-minded, debate-driven, somewhat crusty sort of guy. Having commanded small and large planes most of his life, he is not an emotion-based person, but he cares deeply. In his seventies now, he is fascinated by life as well as intrigued by what others have to say. So now he waited for us to respond. We chimed in with appreciation that this had occurred. One story led to another, each of us telling a tale or two. Marc, for example, spoke of diving off a fifteen foot cliff as a kid and somehow landing safely in the water below with no injuries. Afterward, it frightened him to think he had been so foolish. He felt he was protected by angels. I was impressed; I had never heard of it. This is not such an unusual topic in my family. We chat as easily about religion, the physics of mysticism and God’s work in our lives as music, books, and choice facts or fiction about our family tree. Finally it was my turn. My husband glanced at me. He knew what was coming. He thinks I walk a bit on the wild side of the spirititual life, and he just accepts it. But my sisters know a great deal more about me. They were around much of the time I grew up, after all, although my oldest sister is thirteen years ahead of me and our middle sister is five years older than I. We visit on the phone. We have been there for each other. We have yearly sister week-ends when we take off for somewhere fun, and at end of each day can talk into the wee hours. There was one year when we swapped stories of having seen or spoken with our mother after she’d passed on, and the motel room had fairly vibrated with our love and her essence. That was a powerful night. But some things I have not easily shared in a more public, casual manner, and not for the reasons one might think. I find it difficult to locate precise enough language to share what I have experienced not once or twice, but countless times in my life regarding angelic beings/celestial energy or simply God’s presence. For one thing, they may sound like rather dramatic events. (They seem familiar, natural to me.) For another, they often reflect times in my life that have been taxing. (I have fewer of those but they are often accompanied by extra-ordinary experiences.) And how does one explain what occurs largely beyond the confines of human language? How do I say: “These things–this and this and that–just do happen” and not have someone discount them or look away in embarrassment? Or ask a lot of questions I can’t answer? So I generally keep things to myself. It is enough for me that I get to live this life. It is what it is. But this was my family. It was a pretty day, an afternoon of good food and lazy talk. So, I shared what I thought everyone knew by now, anyway. There were murmurs of assent. I felt the old emotions coming up, a mixture of joy and sadness; this often accompanies the telling. I shifted in my seat, took a drink of water, then turned to my husband. “Another time you might recall was when I had that second stent implant in my artery. I was apparently asleep but not doing so well. I was drifting somewhere outside my body and looked down at a mighty, rushing river. Everything was sepia-toned, from where I was, but the other side was brilliantly-hued. I was excited; I could see crowds on the other side and they were waving to me. I was filled with relief when I saw mom and dad smiling at me, waving. Then, all of a sudden, mom said, ‘Why are you here now? Go back!” and then they disappeared and I came back to my body. I didn’t want to open my eyes yet. I wanted to go back to that river. I was irritated; Marc was shaking me. I awakened and he said, ‘You were so still, like you weren’t breathing! Are you okay? Stay awake now!’ But all I could think about was that river and everyone welcoming me. Once more, as I had often been over sixty years, I was terribly homesick for that other place. I offered two more events that anyone sitting nearby might have thought were scenes from a fantasy or sci fi story. I looked down, felt this was enough telling. Everyone was quiet. “There are a lot more than this, but…I don’t like to talk about it that much. Not everyone understands or cares to hear. It gets to sounding foolish to others, I suspect. 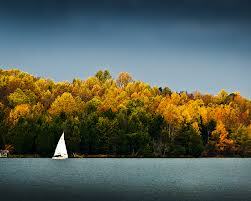 So I keep it close.” I looked into the distance at the tidy white-sailed boats. I thought, I have said too much. His face shone with the intensity of his certainty, his feelings. He started to turn away a little, not accustomed to letting his tears fall before others. And in that moment I was allowed to see him, the man he is, his soul filled with compassion and courage, the complicated beauty of his life. The sacrifices he has made. The burdens carried and released. His devotion to his many friends and his family. His unerring and inordinate love of life. So here I am writing about things I have never planned on sharing with people other than my family. I may not ever do so again. I would have to tell the whole messy story, the most painful bits, in order to get to the miracles known and witnessed, the treasures excavated. More likely I will continue to fictionalize some of it, slip in another God story here and there so you barely see it coming. But the very best experience that autumn afternoon spent with my family was this: everything fell away from R., his heart was bared and his soul, oh, it shone–how, truly, each and every one of them shone. beautiful and very touching, cynthia. Thank you, Skyler; always appreciate your appreciation. Thank you for responding to the post again. Yes, there are many people who have such experiences, yet sometimes don’t talk about. Guess it was my turn to share a little! Really, God is so near us. We just forget.